Enclosing a garage is an easy way to create additional living space in a home. Taking down the door and tracking is probably the most time-consuming part of the process. Frame and cover the door space to turn an attached garage into a family room, bedroom, office or even a small apartment. Sealing the space correctly with exterior siding, plus adding insulation and interior drywall, will help manage heating and cooling costs and turn the area into quality living space. 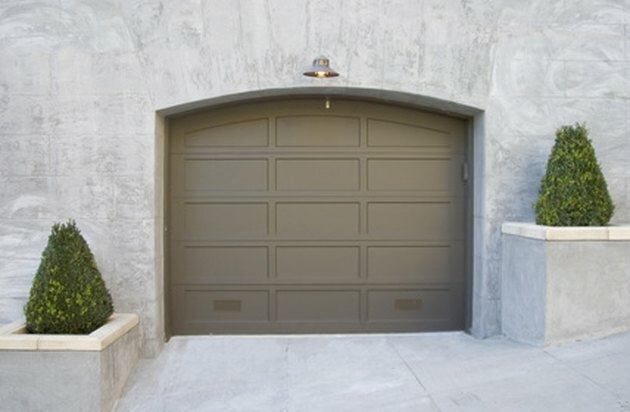 A garage wall can be sealed for building an interior room. Take down the garage door from the tracking system. Engage the help of friends to lift the garage door off its track, and set it aside. Disassemble the track system by using a screwdriver and an electric screwdriver to remove all metal tracking from the rafter areas and door opening. Put the door in a safe place. Recycle the door, or sell it to someone else. Measure the garage door opening. Use 2-by-6-inch lumber to frame in the open garage door space. Secure the framing to the existing wooden door framing and header. Nail all boards into place. Set the boards into the opening with the 2-inch side facing the street, and the 6-inch side forming the depth for adding insulation. Begin this framing process by nailing a framework around the garage door opening only. Install floor-to-ceiling boards (called studs) into the framework every 16 inches. Insulate between studs with fiberglass, roll-type insulation. Staple the insulation into the bays created between the studs. Add drywall on the interior. Nail drywall sheets into place, and seal all seams with with drywall tape. Finish all seams with joint compound, sand and paint. Install wood trim or baseboards as needed on the new wall. Install 1/2-inch plywood to sheath the exterior of the garage door opening. Cover plywood sheets with a protective house wrap material before adding any type of siding. Add siding to match existing house materials on the outside of the new wall. Take your time, and use care to protect your home's curbside appeal. A well executed job will look seamless with the rest of your home. Check the interior and exterior of the door opening for gaps that may allow air transfer. Use caulk to fix any leaks inside the home's interior or around the exterior framing or siding.